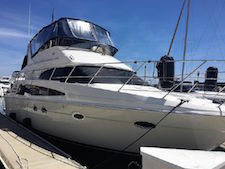 This Californian 55 Cockpit Motor Yacht is located in San Carlos Mexico and is cruise ready , she is Captain maintained and has been extensively upgraded with the following !!!! Complete upgrades throughout this boat. Sleeps(8). Custom interior upgraded appliances, carpet, sofa, headliner, recent interior and exterior varnishing. BIG & ROOMY!!! PLENTY OF SPACE FOR ENTERTAINING FAMILY AND FRIENDS!! 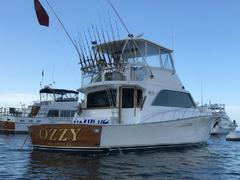 TWIN DIESEL, 2 STATEROOM, LARGE SALOON AND GALLEY W/WET BAR & ICE MAKER!! 2 HEADS W/STALL SHOWERS!! TNT LIFT W/CENTER CONSOLE HARD BOTTOM DINGY!! LOCATED IN DANA POINT!! 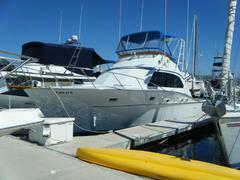 This LLC owned yacht is gorgeous throughout, maintained professionally, in excellent condition. The owner has spared no expense in maintaining her. 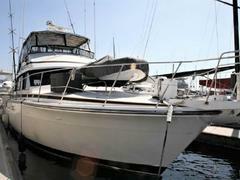 She has Volvo Penta D6 diesel power with IPS Drives! Very low hours, and a pleasure to dock with joystick control. One of the largest in her class, with 2 full staterooms and heads. Quiet, economical, clean. 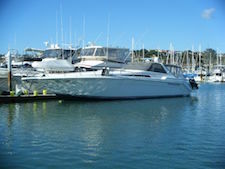 Great for entertaining with a large flybridge, great for families or weekend getaways! This is a must see, undoubtedly the nicest on the West! 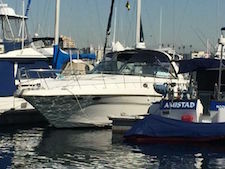 (2015) Archillies 10.5' Tender with new (2015) Yamaha 4 stroke 6hp motor only 4 hours on it.